Archangel Jophiel is an Archangel of beauty, creativity, and clarity. She has a distinctly feminine presence that is gently uplifting, vibrant, and inspiring. Jophiel is a wonderful ally to call upon when you need help seeing the beauty within and around you. She will help you to shift your perspective from focusing on what is wrong and bad, into seeing the positives, beauty and magic that is all around you. She’s especially effective in helping you to see your inner beauty, and in revealing the vibrant light of your soul and the unique gifts, abilities, and traits you have to offer. She will help you awaken to the next level, so you can tune into increased love, magic and beauty in your life. Her energy sometimes feels to me like a burst of creativity and clarity. You may see her as a bright pink light, or feel her presence as flashes of insight, and appreciation of the beauty that is all around… Jophiel shines with the unconditional love of the Divine and would love to help you shine with more of your inner Divine light too. Brightly shining comes in many forms, and so Jophiel will help you to get in touch with what you really love, and with what is in alignment with your authentic soul path. Ultimately your life purpose is something you love, that is fulfilling, exciting and rewarding. Jophiel will help you gain clarity on what you really love so you can begin progressing in the right direction. For some, this may mean help clearing out the old, letting go of clutter, and limitations to make room for more joy, love, and vibrant wellbeing in your life. For others, she may spark creative ideas, rejuvenate your energy, help you to see from a new perspective, uncover your next step, or simply help shift your perspective so you can see your life through the lenses of love. Working with Archangel Jophiel is a little bit different for everyone, because she will help you to tune into what you most need… Even if you are not yet aware of what that may be. Call on Jophiel to help you clear and raise your vibration so you can access true beauty and higher wisdom now. 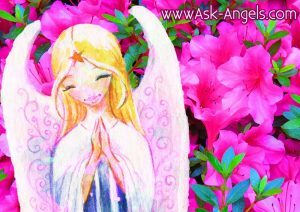 Or click here to access an Angel Meditation with Jophiel!